The Summerfield Garden Club members love gardening and enjoy sharing our knowledge, experience, and the personal joy we receive when working in the garden or with pots on the patio or deck. You don’t have to be an expert gardener to join our fun. You don’t even need a garden, deck or a patio. A love of gardening is all that is required. Our meetings are informal and there is always lots of time for sharing gardening stories and for getting help with all the questions and problems that come with this hobby. Twice a year, in the Spring and Fall, we have a special container workshop, usually at nearby Gardener’s Choice Nursery where the staff gives us new ideas for planting containers and we learn about new plants, garden supplements and accessories. A very popular event every Spring is our plant swap. Garden Club members bring cuttings from their yard, which they have been growing to share at this event. Since many members have plants to divide in the Spring, this is the time we can give away our extras to other gardeners. Other items such as gardening gloves and books, planters, trellises and garden art are also shared and swapped. Besides having lots of fun, each person takes something home they need or would like to grow in their garden. Sometimes we take tours of special gardens and nurseries. Occasionally we have guest speakers. Members contribute to the meetings with special presentations on just about everything related to gardening. 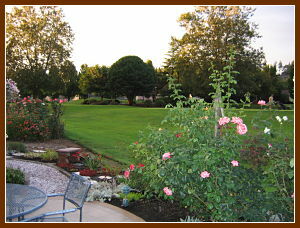 We have a gardening related holiday party each December and sometimes a special party at another time of the year. If you enjoy gardening now or did in the past, come join us and share in the fun!